Clinic4Sport Therapists provided treatments to the runners at Brighton Marathon runners on Sunday 12th April. They were many tired legs and most runners completed their distance injury free. Weather could not be better, sunny but not hot and a nice breeze to cool your muscles regularly. Great Ormond Street Hospital Charity took care of us and helped us organize the queues so that none of the runners had to wait for longer than 5 minutes before having treatment. The award winning race starts with a loop of the famous Preston Park and then takes in the best of the city centre. It’s a fast course and is held on traffic-free roads and promenade tarmac. Take in the sea air and finish on the legendary seafront by Brighton Pier. 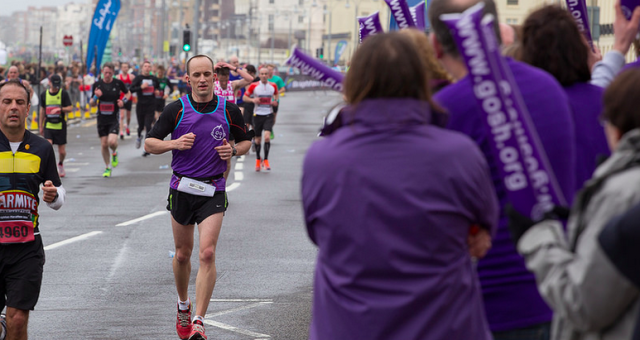 Brighton Marathon is a great alternative to London marathon and year after year it gains popularity within runners. If you are interested in running Brighton marathon next year, you can sign up for a place on Sunday 17th April 2016 HERE. We will be there to help you with your soreness after and assist you with training prior to the event!